Atmospheric pressure near land surface is constantly changing, due both to short-term diurnal temperature and gravitational fluctuations as well as longer-term cycles due to the passage of high-and-low pressure weather systems (Figure 1). Analysis of data taken by the National Oceanographic and Atmospheric Administration (NOAA) in 1998 at the Newark International Airport in Newark, NJ show pressure fluctuations that vary from the mean by 250 N/m2 (2.5 mbar) during 73% of the observations, with variations from the mean greater than 1000 N/m2 (10 mbar) occurring during nearly 20% of the hourly measurements (Figure 2)(NOAA 1999). Rarely will spatial measurement of atmospheric pressure vary more than 300 N/m2 (3 mbar) per 100 km and the rate of pressure change with distance is usually much less than 150 N/m2 (1.5 mbar) per 100 km (Miller and Thompson 1975). 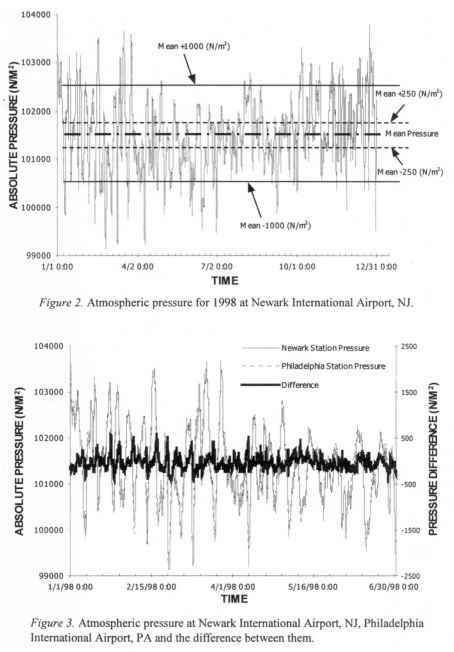 Figure 3 shows atmospheric pressure readings for the first 6 months of 1998 for the Newark International Airport along with readings from Philadelphia International Airport, some 114 km (70.8 mi) away. Differences greater than 300 N/m2 (3 mbar) occur during only 6.2% of the hourly measurements. Pressure gradients may therefore be considered a one-dimensional phenomenon at the field-site scale. Weeks (1978) observed barometric pressure fluctuations at depths up to hundreds of feet in deep unsaturated zones. As the subsurface pressure reestablishes equilibrium with the atmospheric pressure, air is "breathed" in and out of the unsaturated zone. This phenomenon is know as barometric pumping and can affect the transport of volatile organic compounds (VOC) in the unsaturated zone both directly and indirectly. At first thought, it may appear that this "ratcheting" of contaminated soil gas up and down during a barometric pressure cycle would result in a net zero effect on VOC transport. As the decreasing surface pressure that moved contaminated soil gas upward begins the increasing portion of its cycle, the organic vapors would return to their original position in the unsaturated zone. However, at land surface organic vapors that exit the unsaturated zone during decreasing atmospheric pressure are almost instantaneously diluted to nondetectable concentrations. By contrast, because the diffusion coefficient for most VOCs in water is approximately 4 orders of magnitude less than in air, organic vapor transport is limited across the capillary fringe. Therefore, the effect of cyclic atmospheric pressure would be a net flux of vapors out of the system and into the atmosphere. Periods of decreasing atmospheric pressure cause a release of near-surface soil gas to the atmosphere, thus contaminants escape from the shallow unsaturated zone faster than they would by pure diffusion alone. Periods of increasing atmospheric pressure will force uncontaminated surface air into the shallow unsaturated zone. This in turn increases the rate of diffusion by lowering the surface where the contaminant concentration is zero below the true ground level (Auer et al. 1996). Massman and Farrier (1992) simulated gas transport in the unsaturated zone resulting from atmospheric pressure variations using the single-component advection-dispersion equation. They found that "fresh" air can migrate several meters into the subsurface during a typical barometric pressure cycle. These effects may be compounded by the presence of fractures, partially penetrating cracks or boreholes open to the unsaturated zone (Holford et al. 1993; Schery et al. 1988). Figure 1. 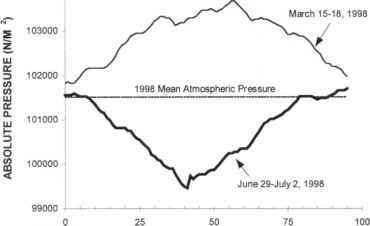 Atmospheric pressure variations between March 15-18, 1998 and June 29-July2, 1998 at Newark International Airport, NJ. In an early study by Schery and Gaeddert (1982), an "accumulator" device was used to measure the effect of atmospheric pressure variations on the flux of Radon (222Rn), an inert radioactive element with a half-life of 3.8 days, from the soil. Fluxes measured by the accumulator were compared with predictions for flow-free diffusion from a model developed by Clements and Wilkening (1974), which applies Fick's law. A mean 222Rn-flux enhancement of about 10%, with a high value of 20%, due to cyclic atmospheric pressure variations was observed. However, the device's effectiveness was limited by back diffusion from the accumulator to the subsurface, leading the authors to view the flux values as semi-quantitative. In an effort to simulate flux ofthe fumigant 1,3-dichloropropene (1,3-D) to the atmosphere, Chen et al. (1995) found that existing models for chemical transport and flux in soils considered advection and dispersion of solute in the liquid phase with organic vapor diffusion being the only transport mechanism for the air phase. Organic chemicals with high vapor pressures were typically modeled by increasing the effective vapor-phase diffusion coefficient in order to simulate measured experimental fluxes. The researchers modified an existing pesticide version of the simulation model LEACHP by adding explicit simulation of advective transport of the vapor phase driven by barometric pressure change at the soil surface. The resulting model, LEACHV, was then used to simulate 1,3-D fluxes from a Salinas Valley, CA field site which were compared to field fluxes determined by the aerodynamic method. The model was able to simulate the same general pattern as field measurements of flux in response to changes in barometric pressure (Figure 4). Model results showed that barometric pressure changes over the measurement period drove advective vapor movement through unsaturated zone soil and ultimately to land surface. However, these researchers did not collect subsurface pressure measurements with which to calibrate and verify the airflow part ofthe model. show that subsurface air deeper than ~1.75 m never reach land surface (Figure 5). The volume of air removed by barometric pumping was shown to be independent of the period of the pressure cycle, but proportional to the depth of the lower boundary. where D , is the intrinsic molecular diffusion in the porous medium; m is the dispersivity; and \V\ is a positive measure of the air velocity. Dispersion arises from the fact that, even in a relatively homogenous porous medium, small-scale heterogeneities exist which cause airflow to proceed along various channels at different rates. Barometric pumping causes a significant increase in the coefficient of hydrodynamic dispersion over a pure diffusion-based transport model, thus increasing the overall transport rate. The authors presented three simulations to underscore the relative contributions of barometric pumping on unsaturated zone transport: a baseline case of pure molecular diffusion transport alone, a case of direct effect of barometric pumping of the soil gas, and a final simulation incorporating both the direct effects of soil-gas pumping and indirect effects of increased mechanical dispersion. It was found that the surface boundary condition altered by barometric pumping in the second simulation did not significantly affect the rate of diffusion transport. However, when the complete effects of barometric pumping were included in the model, as little as 13% of the original contaminant mass remained after 50 years, compared with 49% for diffusion only (Figure 6). Figure 6. Mass fraction of theoretical contaminant mass remaining vs. time for various values of the hydrodynamic dispersivity, a. Atmospheric pressure changes at land surface cause advective subsurface air flow, increasing dispersivity which significantly affects the rate at which volatile contaminants escape from a layer. Reprinted from Auer et al. (1996), Copyright 1996, pg. 157, with permission from Elsevier Science. In a recent study, Elberling et al. 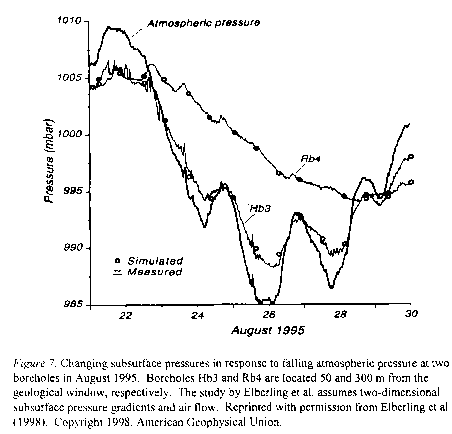 (1998) looked at the effect of barometric pumping on the transport of atmospheric oxygen within the unsaturated zone. A field study was carried out in a glacial till aquifer with a 10-12-m thick sand unsaturated zone. The sand deposit is overlain by up to 20 m of very low permeability clayey till, except for a small "geological window" where the clay cap has been eroded away, exposing a 30m by 20m outcrop area of relatively high permeability sand. 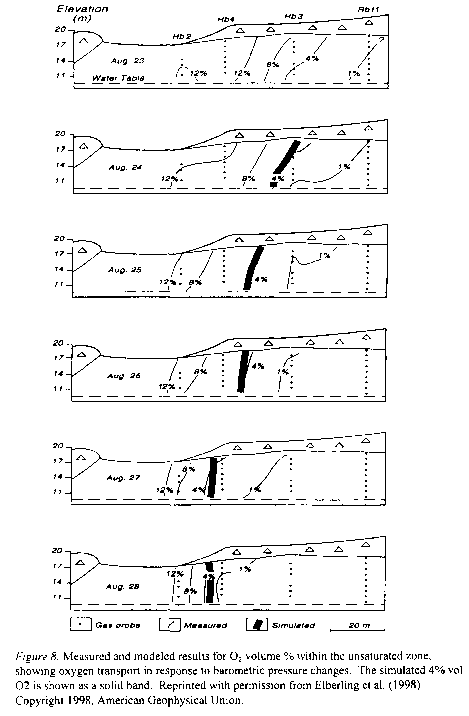 The authors proposed that atmospheric pressure variations are propagated throughout the sandy unsaturated zone through this window, causing both vertical and horizontal pressure gradients and resulting in 2-dimensional airflow and transport of oxygen in the subsurface. Vadose zone pressure variations and oxygen concentrations in response to changing atmospheric pressure were also modeled using the numerical groundwater model SUTRA. The authors achieved good matches for both pressure and oxygen concentration modeling (Figures 7 and 8). They found a clear relationship between variations in atmospheric pressure and changes in the subsurface soil gas pressure. During a barometric pressure cycle, atmospheric oxygen was transported more than 10 md-1 horizontally in the clay-capped unsaturated zone. Other researchers have indicated the possible significance of barometric-pumping-induced advective transport based on the discovery of non-linear vertical concentration profiles in the unsaturated zone. In an extensive yearlong field study, Smith et al. 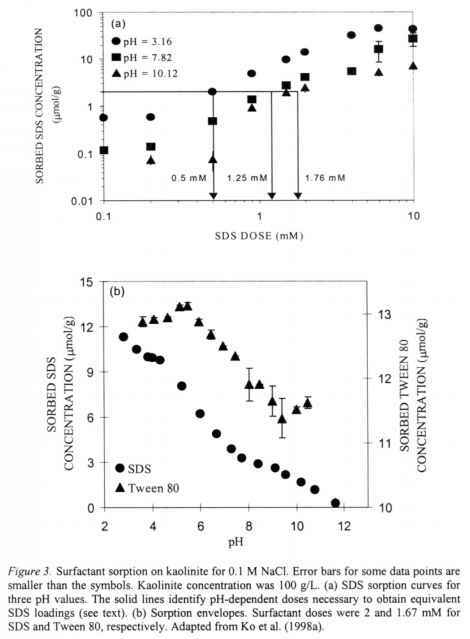 (1996) measured total and diffusive vertical fluxes of trichloroethylene (TCE) from the unsaturated zone to the atmosphere above a contaminated water-table aquifer at Picatinny Arsenal, NJ. Total TCE flux measurements were made with a vertical flux chamber (VFC) while diffusive fluxes were estimated with Fick's law. Unsaturated-zone vapor-phase concentration profiles necessary for calculations using Fick's law were obtained by soil-gas sampling using nested vapor probes and adsorbent traps. Of the 29 different vertical profiles measured at 3 different locations during the study, a majority increased approximately linearly with depth. However, distinctly nonlinear concentration gradients were also observed. These researchers found that of the 15 attempts made to simultaneously measure diffusive and total fluxes, 7 were unsuccessful because of non-linear unsaturated-zone soil-gas concentration profiles. The remaining eight pairs of measurements were compared and it was found that the total and diffusive fluxes were of similar magnitude only three times. In most cases, the total flux was 1-4 orders of magnitude greater than the diffusive flux predicted by Fick's law. Using a spatial averaging technique, the researchers calculated that the average annual flux from the subsurface to the atmosphere using VFC measurements was approximately 50 kg/yr, which is comparable in magnitude to the TCE removal rate of approximately 70 kg/yr from a pump-and-treat system operated at the site over the same time period (Imbrigiotta et al. 1995; Smith et al. 1999). The total flux was significantly larger than the 0.05 kg/yr diffusive flux predicted from vapor probe measurements and Fick's law. These researchers concluded that the comparison of total and diffusive fluxes suggested that processes other than steady-state diffusion were occurring in the unsaturated zone and contributing to the transport of TCE vapors to land surface. One possibility cited by the researchers was the advection of TCE vapors in response to changes in atmospheric pressure. Numerous studies have indicated the potential importance of atmospherically-induced subsurface pressure gradients on unsaturated-zone airflow and contaminant transport. While modeling studies have proven effective in gaining insight into the mechanisms of barometric pumping in the unsaturated zone (Auer et al. 1996; Elberling et al. 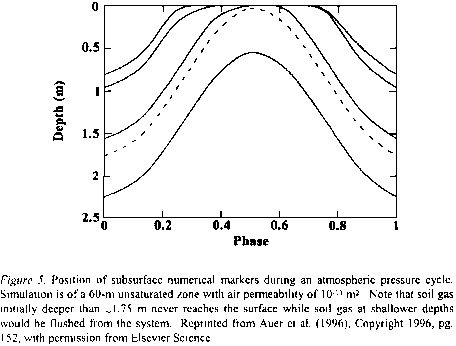 1998; Massman and Farrier 1992), actual field data on atmospheric and subsurface air pressures are necessary to calibrate and validate vadose-zone airflow models. Except for the specific study of 2-dimensional subsurface airflow caused by a "geological window" performed by Elberling et al. (1998), none of the research presented attempts to match modeling results with subsurface data collected during natural atmospheric pressure changes. Also, before conclusions can be drawn about the ability of flux-measuring technologies to accurately and precisely quantify solute transport from the unsaturated zone to land surface, rigorous laboratory testing of these instruments must be conducted.